Cleaning out our freezer one day, I noticed I still had a utility duck in there gathering ice crystals. I thawed out the duck and figured what I was going to do with it. I knew I was too impatient for the duck to thaw out completely and I felt too beat to do butchery of a partially frozen duck. I decided to keep it whole and threw it into a pot of water. I added some green onions, a handful of cilantro, and ginger in with my bird. I put the bird in before I went out for the day, with instructions for people in the house to turn it off after a couple of hours. I figure I'd make noodles in soup with it when I get home. That afternoon, feeling still too beat to do much anything else, I fished out the duck and started shredding the meat. In another pot, I started sautéing some onions, garlic, ginger and pieces of Chinese sausage. I strained the duck stock into this pot and added the duck shreds. I also had some yu choy greens so I chopped them up and added into the soup. 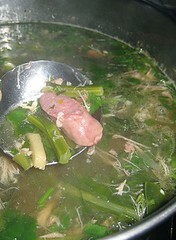 A touch of hoi sin for a certain je ne sais quoi and the soup was done. 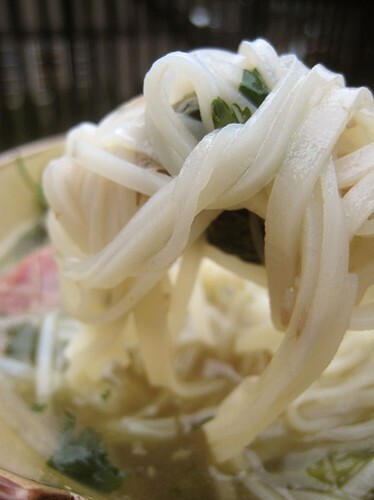 I soaked some rice noodles in hot water, and when they were pliable, added them into the soup. This is a quick one-dish meal and it was quite tasty too. Satisfying and comforting after a long day. Perhaps my only complaint is that I had to clean up two pots, two strainers afterwards. Put all ingredients in a pot, including water, and wait for it to boil. Once boiling, you may need to skim for foam and any other impurities. Lower heat and let simmer for 2 to 3 hours. Strain out all solids. Heat oil in pot. Add Chinese sausage. Add green onion, ginger and garlic with Hoisin sauce and sauté until fragrant. Add duck broth. Add shredded duck. 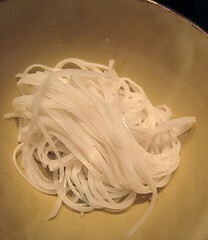 Meanwhile, soak noodles in hot water for approximately 5 minutes or until pliable. When ready, drain. Add drained noodles to the pot. Add greens and cilantro. Season to taste. Looks like a wonderful soup! I love how it's hearty enough as a meal on its own! I've been sick and a bowl of this would make me feel better instantly. It seems this hits the "comfort food" spot in us Asians, hehe. This looks awesome! Great photos too. What kind of noodles do you use? I seem to always have problems when using rice noodles - if I soak them, they always seem too firm or not pliable enough to eat, and if I try to cook them, they usually end up too mushy. 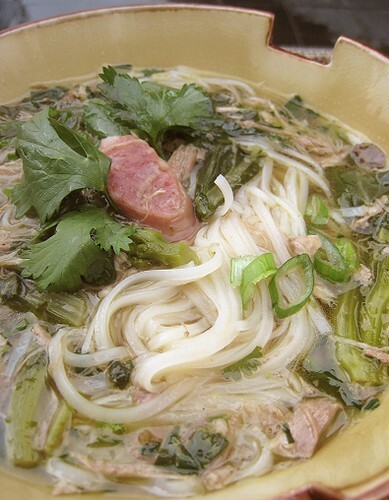 We use the rice noodles for pho. We came up with not bothering to cook them in boiling water. Basically we just soak them in hot water and wait until they almost have have the texture that we are looking for (90-95%). Once that's the case, we drain them. Then we add them to the dish: if it's a stir-fry dish (eg, pad thai), then they'll cook all the way to 100% during the stir-fry. 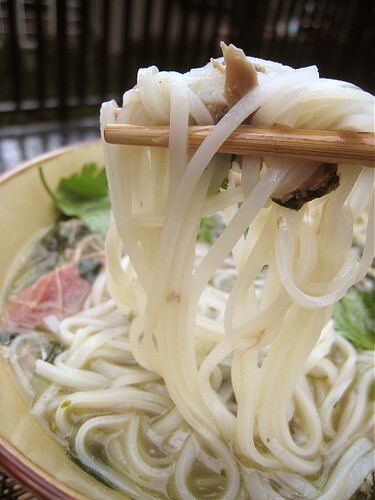 For soups, we add the drained noodles to the hot broth and serve immediately. The hot soup cooks them to 100%.